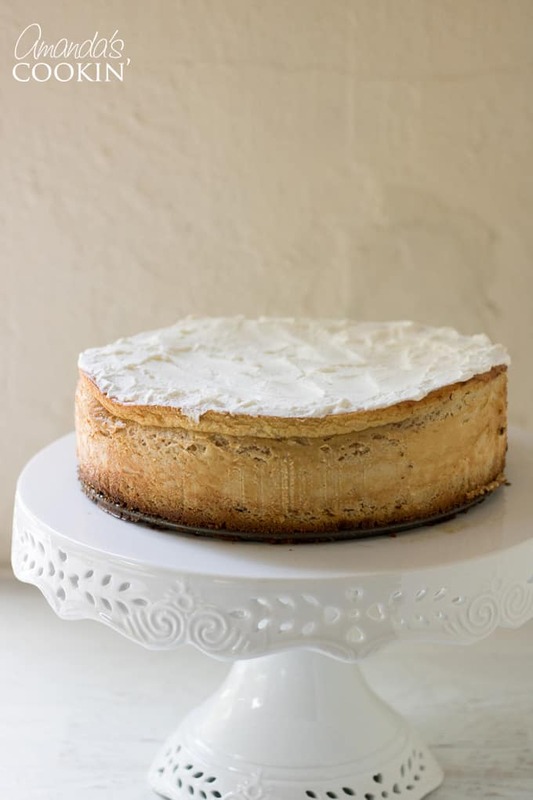 Tiramisu Cheesecake: a combo of tiramisu and cheesecake you'll love! You are truly going to love me. Do you remember the English Trifle Cheesecake I posted a before? 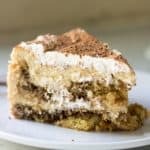 Well, this amazing Tiramisu Cheesecake follows the same basic concepts with the fabulous flavors of that ever-popular Italian dessert. Let me tell you, this is one delicious cheesecake! 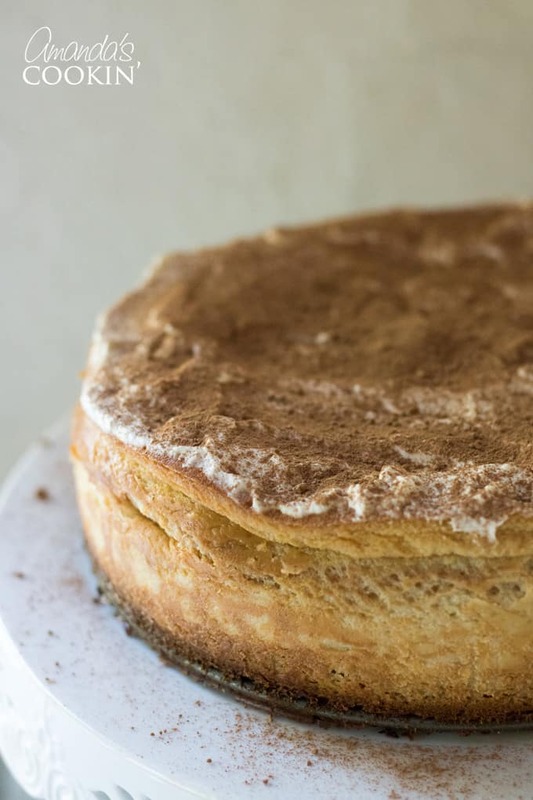 If you like tiramisu and are a fan of cheesecake, you will definitely want to give this tiramisu cheesecake a try. 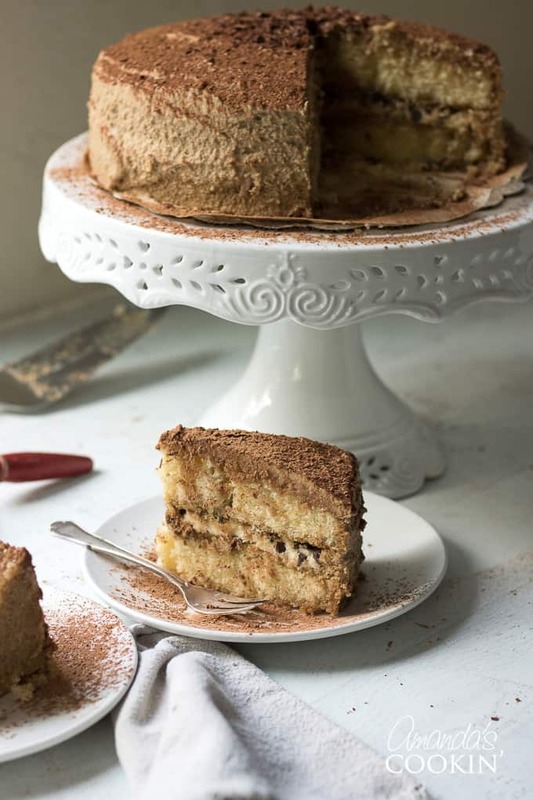 It’s great for having family and friends over or for a tea party, as tiramisu is considered a sophisticated dessert. Mix that with cheesecake… what could be better? Grab all your ingredients and let’s get started. Preheat the oven to 325 F. Bake your cake and slice it in half. Grease the bottom and sides of a 9″ springform pan. 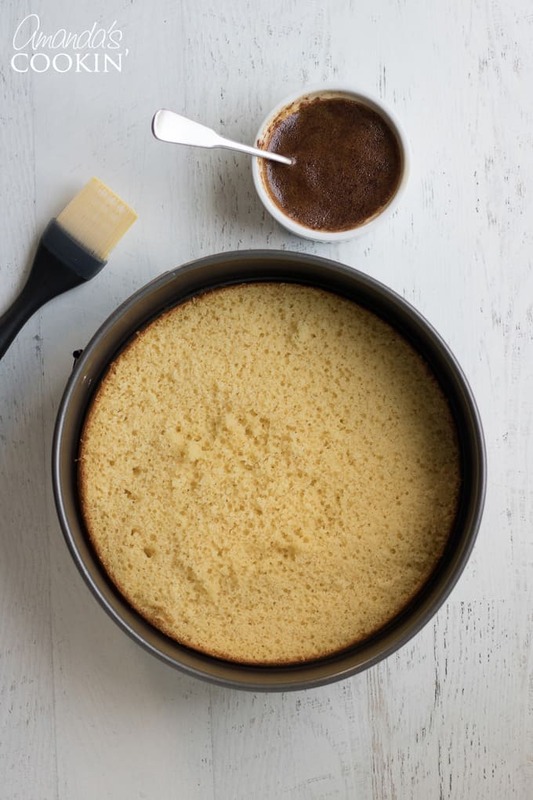 Place half of the cake in the bottom of the springform pan. In a bowl, combine the coffee liqueur and the espresso powder. Brush about 1/4 of the espresso mixture onto the cake layer that’s in the pan. Brush the second cake layer with 1/4 of the espresso mixture. Set the cake layers and remaining espresso mixture aside. Fit mixer with paddle attachment. 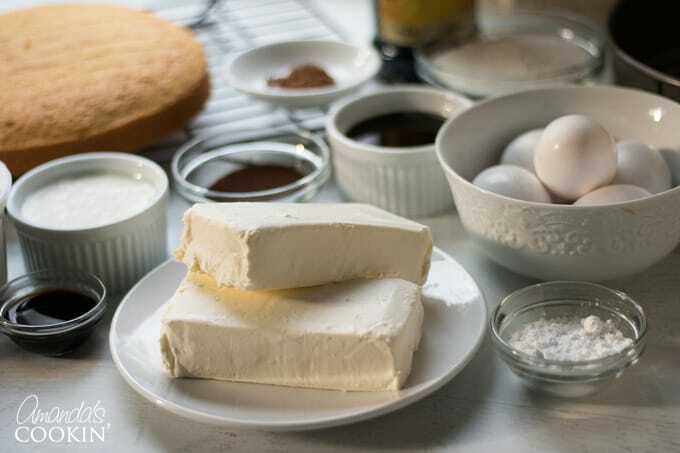 Beat mascarpone, cream cheese and sugar on medium-high speed until smooth and creamy, about 3 minutes. Add eggs, on at a time, beating well after each addition. 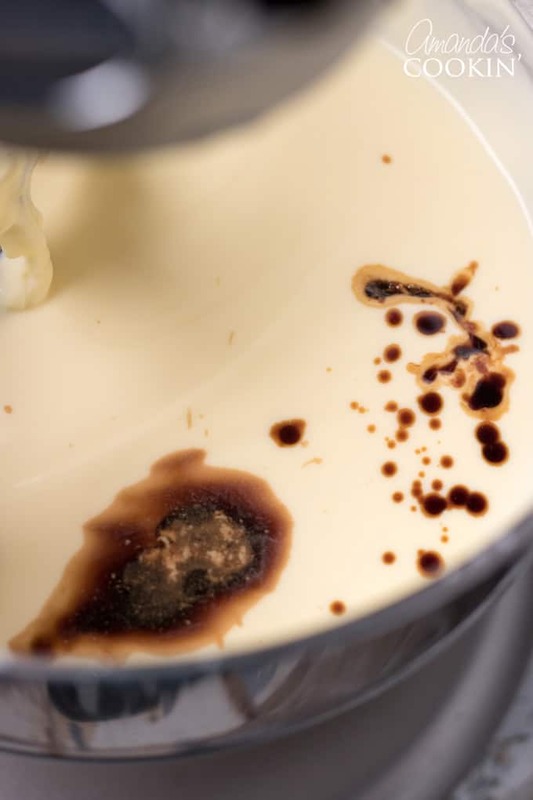 Mix in the vanilla and the remaining espresso mixture. Pour half of the batter over the cake layer in the pan, smoothing out the batter to the sides of the pan. Pour in the remaining batter, again, smoothing out to the sides of the pan. The pan will be filled to the top edge. 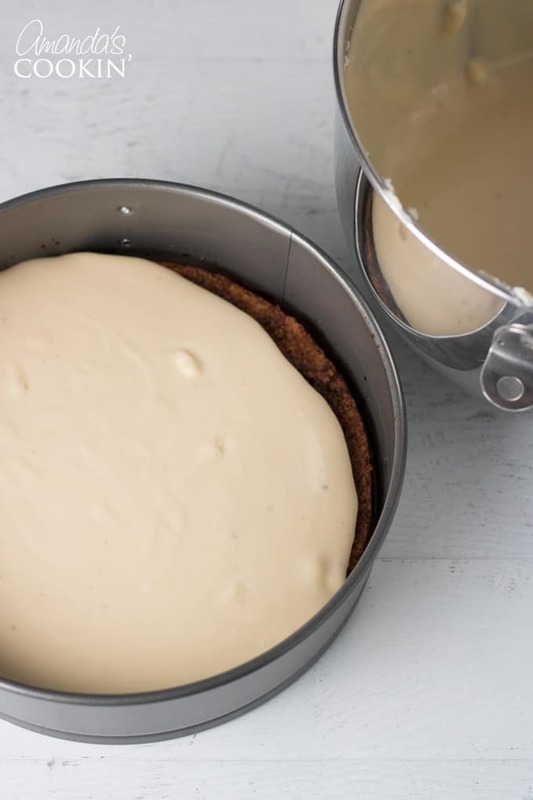 Place cheesecake pan on a cookie sheet and bake 50-55 minutes, or until light golden brown and center is slightly jiggly. Let cool in the pan on a wire rack for 2 hours. Cover with plastic wrap and refrigerate for at least 6 hours before adding topping. 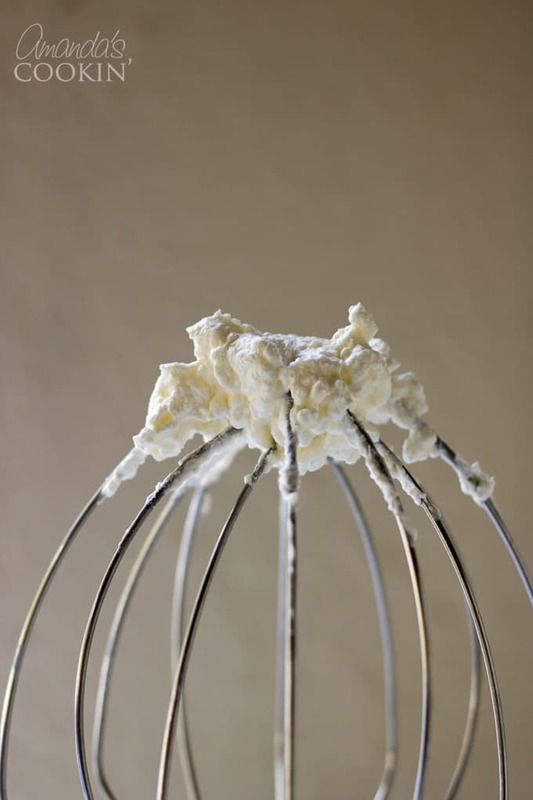 Using the whisk attachment, beat the heavy whipping cream and the powdered sugar on medium-high until firm peaks are formed. 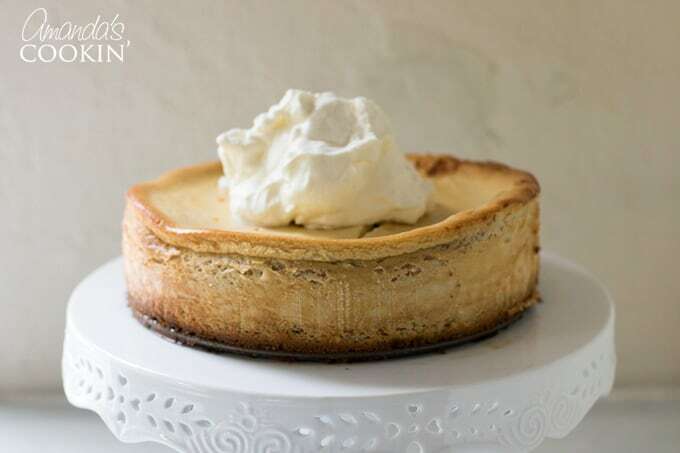 Spread whipped cream on top of the chilled cheesecake. Use a sifter to dust the top with cocoa powder. 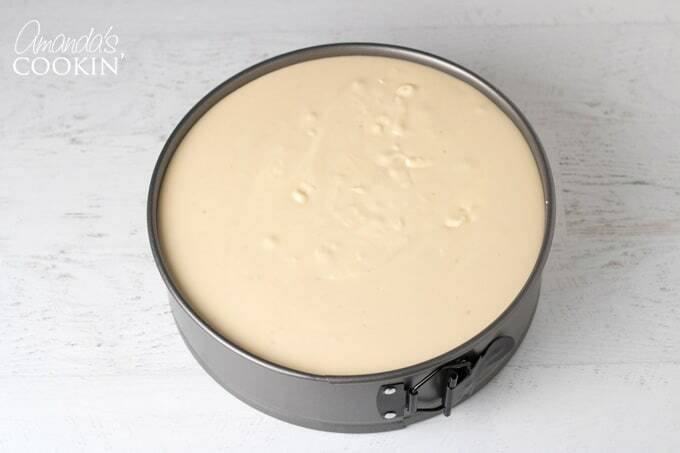 Your cheesecake is ready to go! Slice and serve and enjoy the look on everyone’s faces as they take their first bite! Now, revel in your accomplishment. 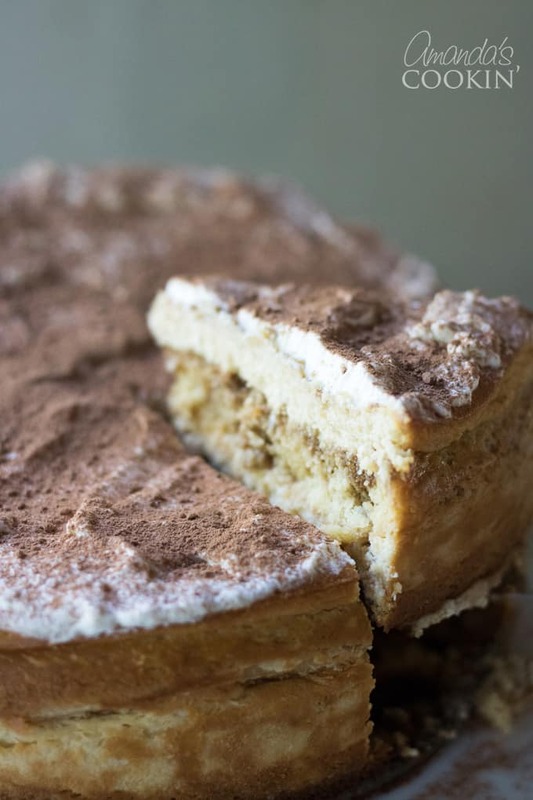 If you’re a fan of tiramisu like my we are, you’ll love this tiramisu cake as well! 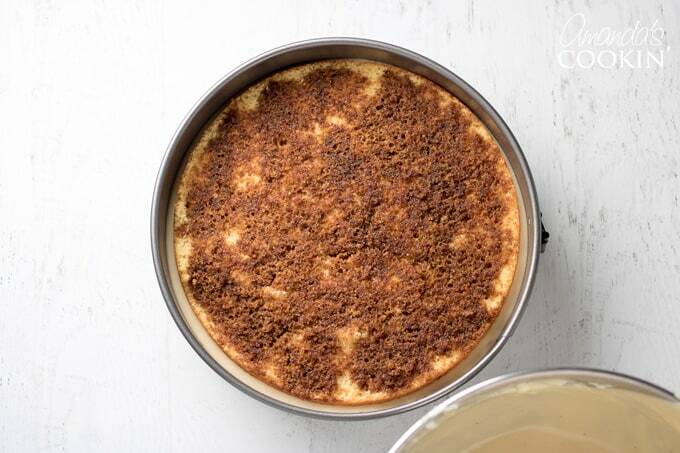 Think of our tiramisu cheesecake, without the cheesecake. Another great party or gathering cake your guests will LOVE. 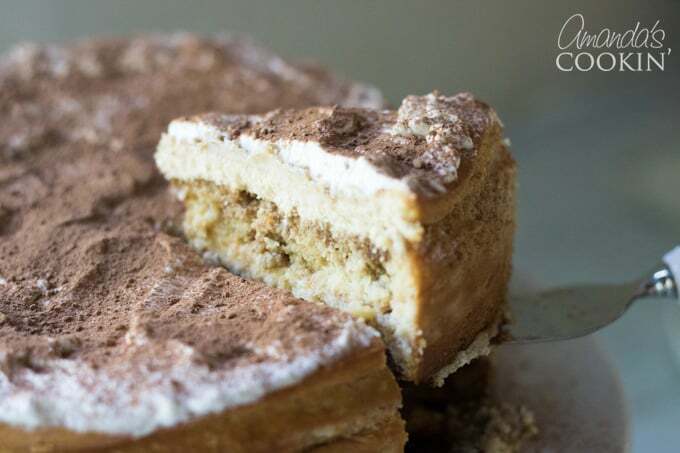 Tiramisu lovers rejoice because we have ANOTHER recipe you’re sure to love! 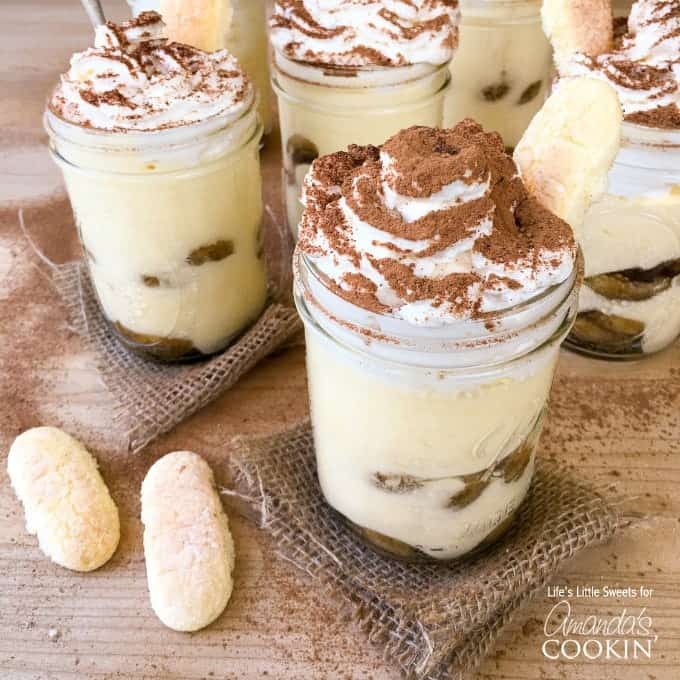 These tiramisu trifles served in mason jars contain 2 layers of espresso-soaked ladyfingers, rich cream and whipped cream dusted with cocoa. Aren’t they so cute? 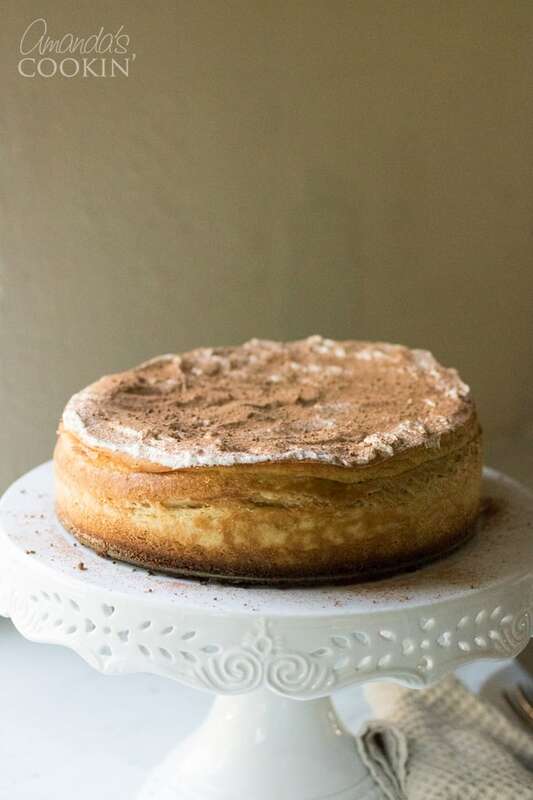 All the flavor if tiramisu in a creamy, delicious cheesecake! 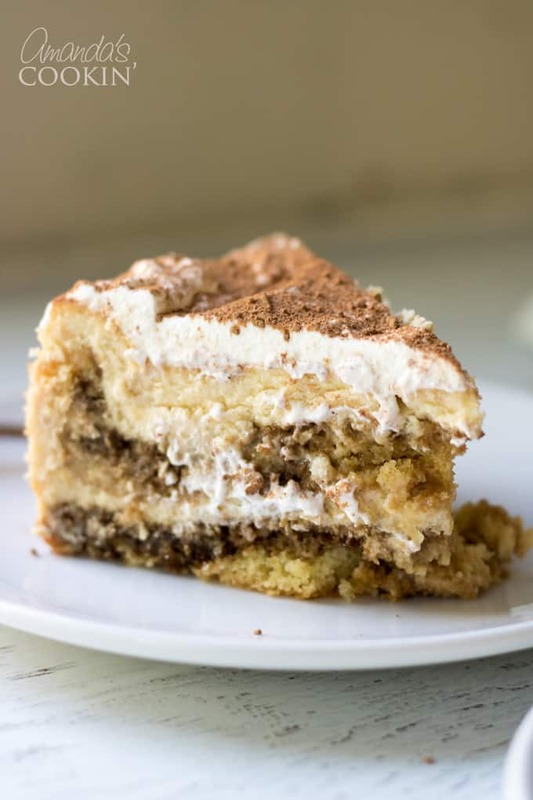 Tiramisu and cheesecake lovers no longer have to choose. Preheat the oven to 325 F. Grease the bottom and sides of a 9" springform pan. 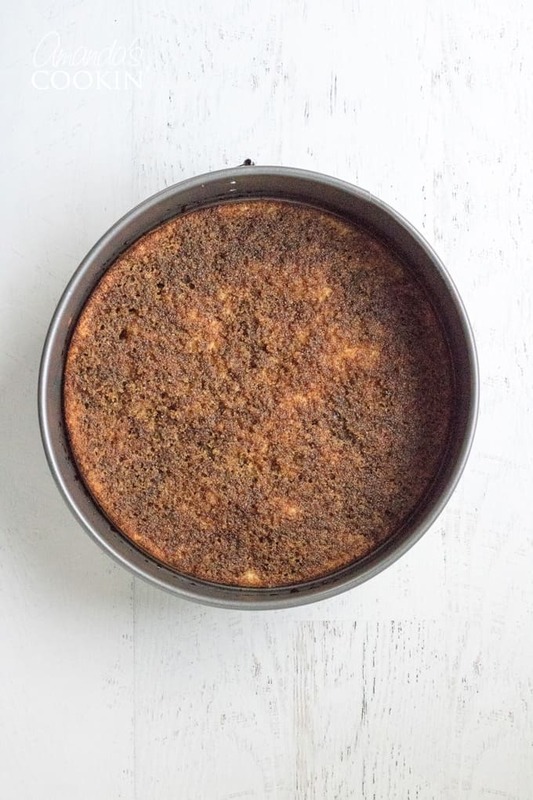 Place half of the cake in the bottom of the springform pan. In a bowl, combine the coffee liqueur and the espresso powder. Brush about 1/4 of the espresso mixture onto the cake layer that's in the pan. Brush the second cake layer with 1/4 of the espresso mixture. Set the cake layers and remaining espresso mixture aside. Fit mixer with paddle attachment. 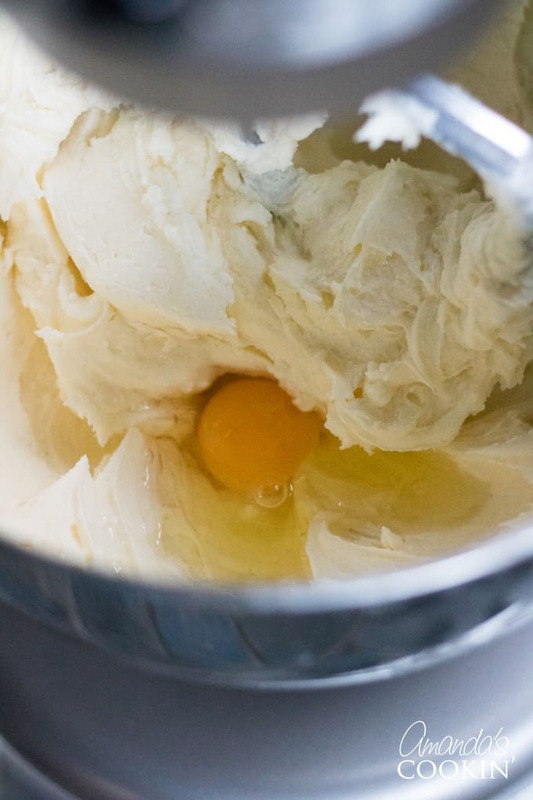 Beat mascarpone, cream cheese and sugar on medium-high speed until smooth and creamy, about 3 minutes. Add eggs, on at a time, beating well after each addition. Mix in the vanilla and the remaining espresso mixture. Pour half of the batter over the cake layer in the pan, smoothing out the batter to the sides of the pan. 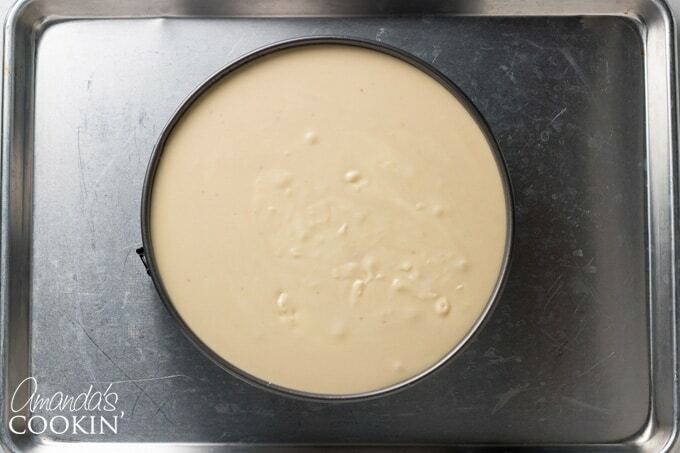 Place second cake layer on top and pour in the remaining batter, again, smoothing out to the sides of the pan. The pan will be filled to the top edge. 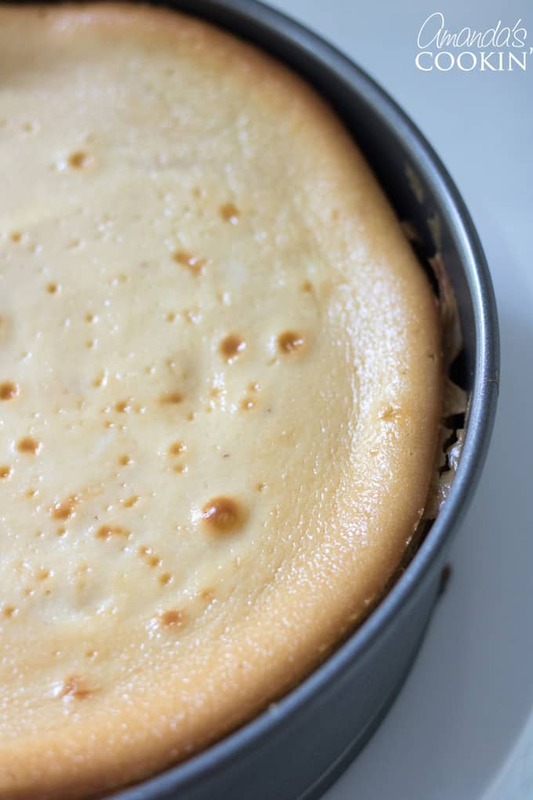 Place cheesecake pan on a cookie sheet and bake 50-55 minutes, or until light golden brown and center is slightly jiggly. Let cool in the pan on a wire rack for 2 hours. Cover with plastic wrap and refrigerate for at least 6 hours before adding topping. 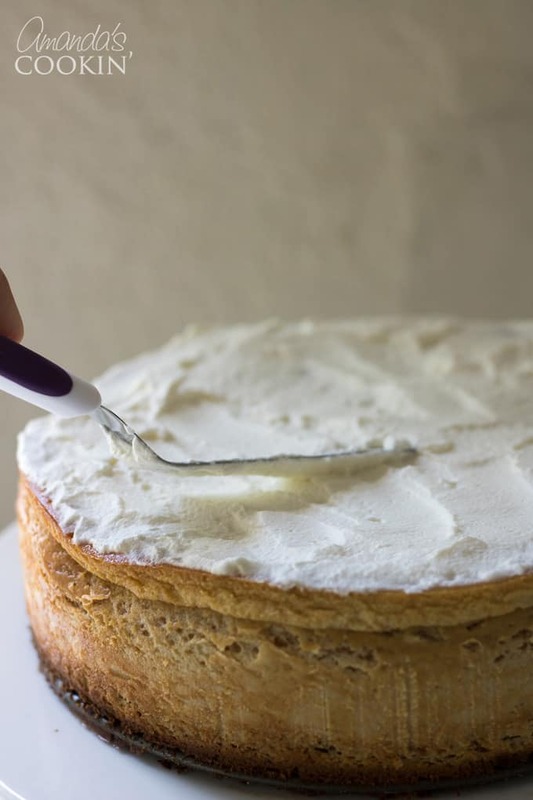 Using the whisk attachment, beat the heavy whipping cream and the powdered sugar on medium-high until firm peaks are formed. 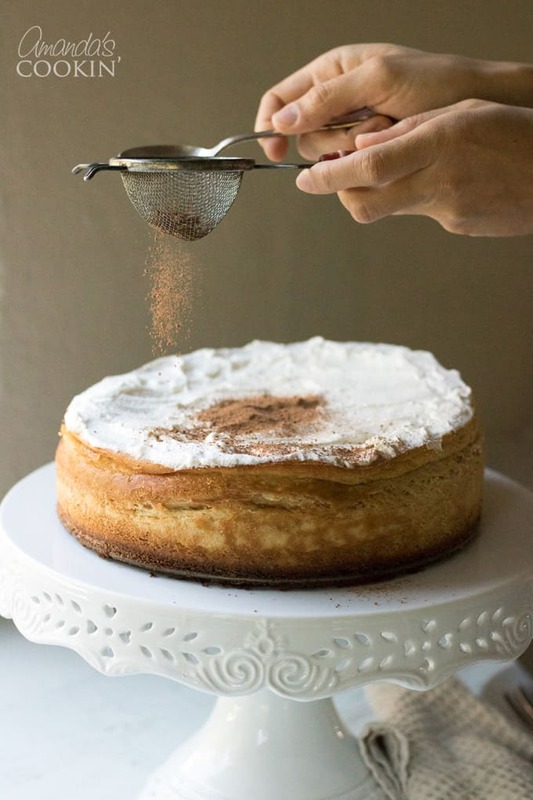 Spread whipped cream on top of chilled cheesecake, then use a sifter to dust the top with cocoa powder. This post was originally published on this blog on Jul 27, 2011. I love Tiramisu! Looks so delicious and perfect for hosting!